Very cute and perfect quilting, it's always a plus to give a child that pertains to their 'likes'. I’m quite sure it’ll be a hit with Vincent and I agree on the quilting! For this quilt it’s perfect! it's perfect! and Lady Jayne suits you! I wasn’t sure I wanted to share the Lady Jayne name…but, it’s all Vincent and he’s just plain adorable so I had to! Awesome! He will love it, but you are right, if a toy is within sight that might get a bigger reaction. But I bet he will sleep under it that very night. I believe that will be true! Toys loose their charm, but a quilt is forever! Bowser turned out wonderfully, Jayne! 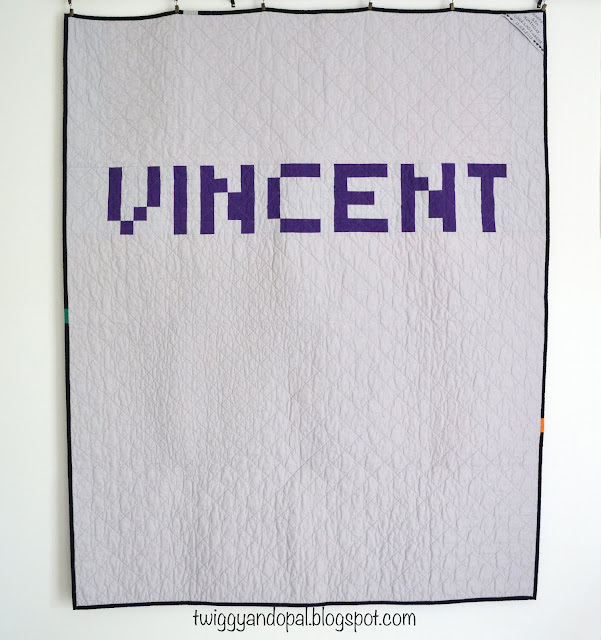 I agree that the quilting is perfect for it, and I love how you put his name on the back, too. Vincent sounds like a cutie! Hopefully I can get a picture of him and his quilt and share on the blog! He’s is a cutie and one of those ‘old soul’ kind of kids! 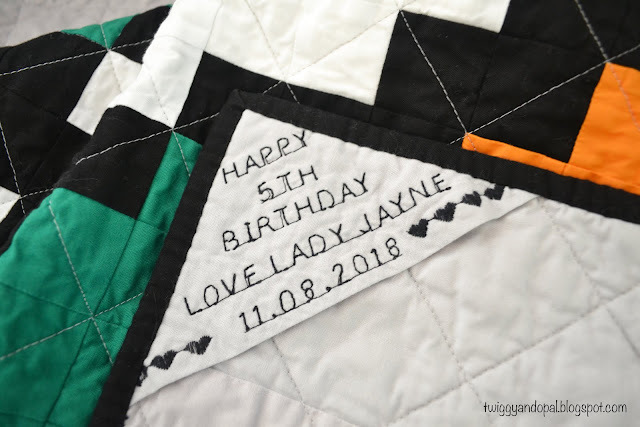 Amazing quilt for a lucky 5 year old!!! Perfect quilting and perfect label!!! Great job, Jayne!!! I'm not gonna lie. Deep down I would be hoping he says I LOVE IT!!! I really hope that's the reaction you get after all the thoughtful touches and work you put into that quilt. Can't wait to hear! When are you giving it to him? I know Janice! I want him to flip out, but if he doesn’t I know he will love it and it will most likely outlast any new toy he will receive! I’m not sure when I’ll be able to give it to him. His birthday isn’t for another week and I’m not sure if their will be a big shindig or when! I hope to take a picture of his reaction and I’m sure his mom will allow me to share on the blog! 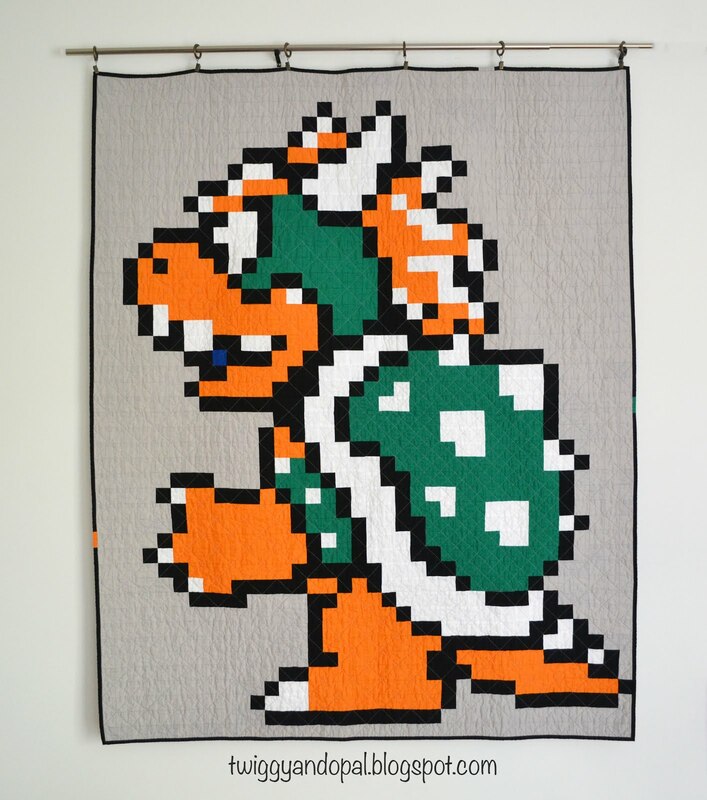 I'm pretty sure he'll recognize Bowzer and love the quilt. Love that you added his name on the back; how cool is that?! Lady Jayne easily beats out my nickname of Ladybird (yes, story there), but hearing "Wady Jayne" is just so stinkin' cute! Nice finish, Jayne! 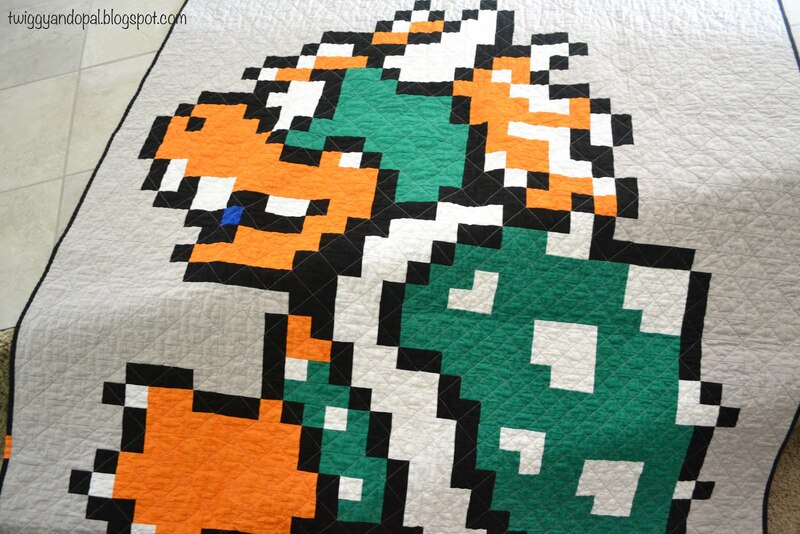 A great job and the quilting is perfect. I like the little extra colors in the binding. When my granddaughter was six, I made her a quilt and embroidered her name on the back. That's the side she wanted up because it said her name! Wowzer! This is amazing. He will be so thrilled. This is so cool! 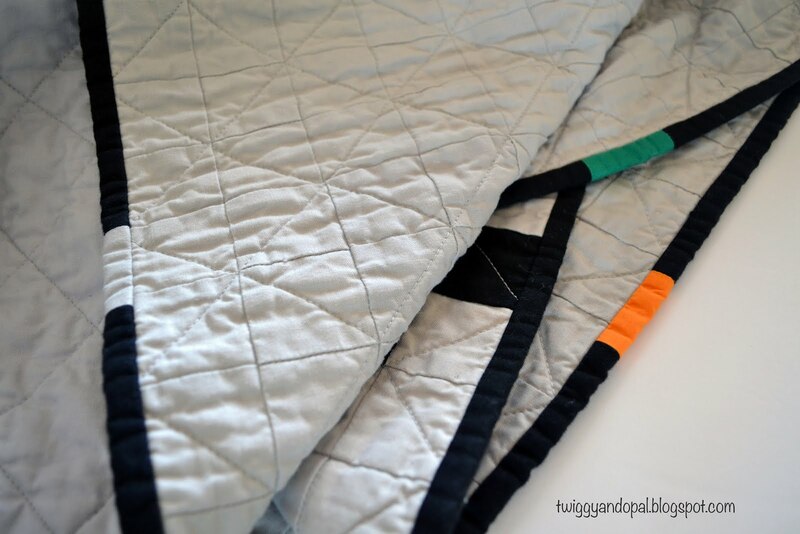 Do you quilt on a domestic or longarm? The reason I am asking, I've been contemplating diagonal quilting on a longarm. And if its best to quilt each section as you go, or roll back and forth for each line? Make sense? Vincent is the luckiest boy ever. And that is just fine. Because I have a personalized quilt from you and that makes me the luckiest gal ever :-) Have a great weekend. I am pretty sure this will become one of his favorite possessions. It is a really fun and unique quilt. Love, love, love! It's just adorable! I recognized it instantly. Pixel art is the best!